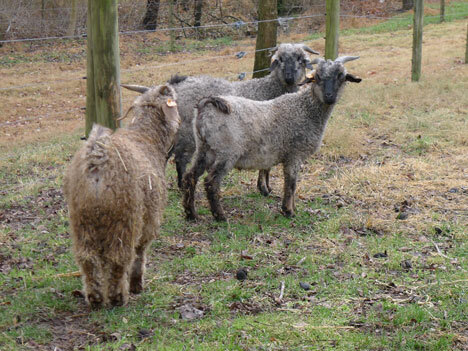 when it comes to appearance and behavior, i think goats are my favorite fiber animal. 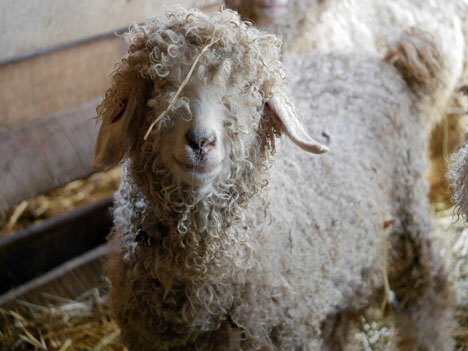 i love their light, springy movements and delicate features; i’m amused by their funny faces, made all the more mischievous when topped by a glowing halo of curly fleece. 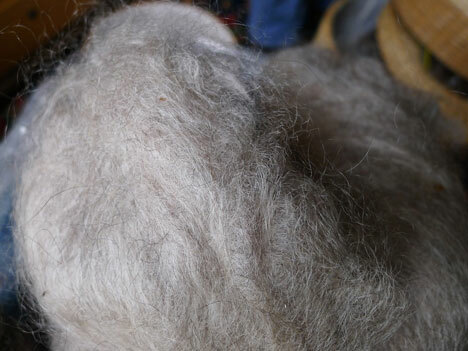 last spring we were lucky to be able to explore mohair fiber in our bare naked knitspot club. 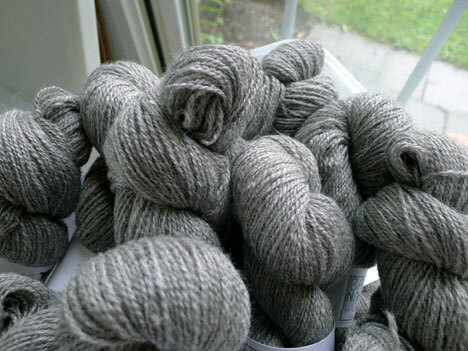 and while mohair yarns are plentiful throughout the knitting universe, undyed mohair yarn is scarce—and nonexistent in the quantities we required for our club. as you know, all we need to hear is that something doesn’t exist and we set off to make it happen. 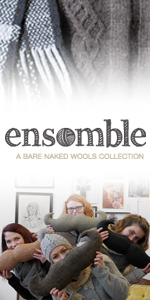 and so it was with our quest to provide a quality mohair yarn that any knitter could love. 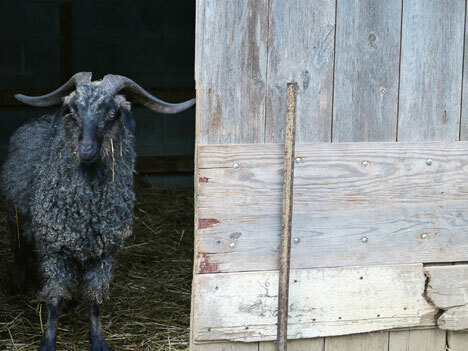 and so we began asking about mohair farms through friends and at shows; this research eventually led us to pinxterbloom farm in eastern pennsylvania, home to john and jeanne frett and their gorgeous flock of angora goats. 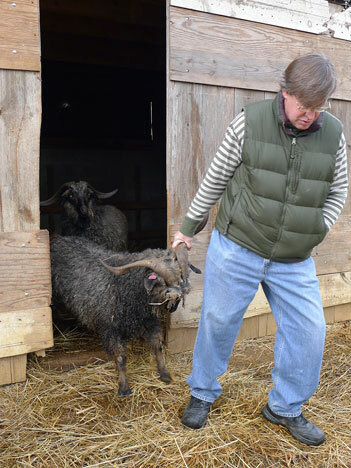 in addition to his angora goat enterprise, john is a professor of landscape horticulture at the university of delaware and director of the university botanic garden. 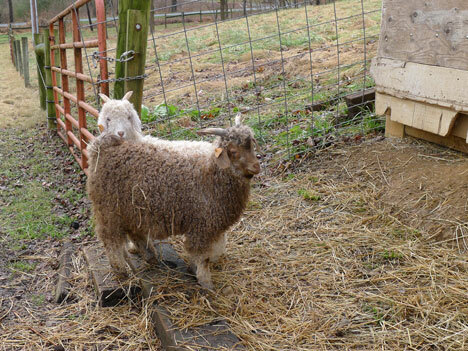 at the peak of the season, john’s herd numbers between seventy and eighty goats, with as many colored goats as he can breed (breeding for color in goats is not very straightforward; for more in-depth information on this topic, please my BNK 2014 eBook). 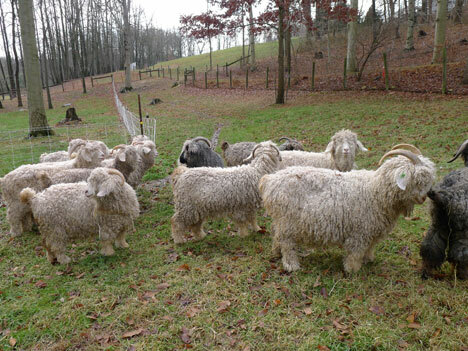 by diligent breeding, john has managed to develop a representation of about 25 to 30 percent colored fleeces; these range from reds (brown and fawn fleece) to black (gray and black fleece). 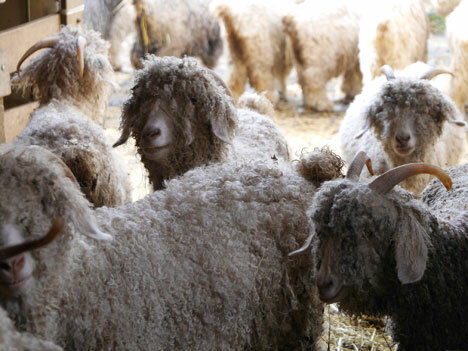 interestingly, the reds are darkest close to birth and grow lighter as they mature, often ending up with pinkish, creamy white fleeces. 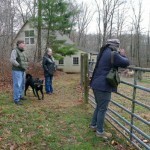 during our visit to the farm in december 2013, we got to tour the barns and grounds to meet all the adorable residents. john talks about his goats as if they are people; it’s not always clear at first that the characters in his stories are animals. Kidding is finished for the year. Five colored buck kids, 4 brown and one black, and five doe kids, one brown and 4 white. They are off to a great start. This year all of the kids are named after redbuds an early flowering small tree native in this area. Some of the names are, Cercis, Racemosa, Silaquestrum, etc. They are a great source of amusement and inspiration; watching them leap around and dart in and out of the barn is energizing and soul lifting. 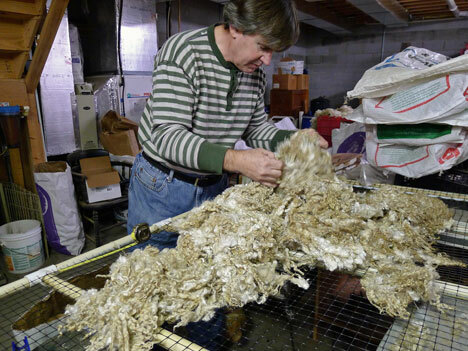 after a look around the place, we headed indoors to and down to john’s basement workshop, where fleeces are sorted and skirted to make them ready for sale. some will be sold to hand spinners at retail wool shows and the rest will be sold on the market for use in making textiles. john runs us through the process of sorting, skirting, and measuring the staple length while determining the grade and weight of each fleece. whatever isn’t discarded in placed in a bag and marked with this data, as well as the name of the animal that produced it. there was a good stock on hand the day we visited, with some fleeces left from the previous season and some still left to grade from the fall clip. as the work progressed downstairs anne marie and i wandered upstairs to talk to jeanne, who showed us the beautiful rolags of hand-carded mohair fiber (she gets pick of the fleeces each year!) 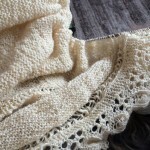 as well as some of the beautiful items that she and john make from their handgun mohair yarns. 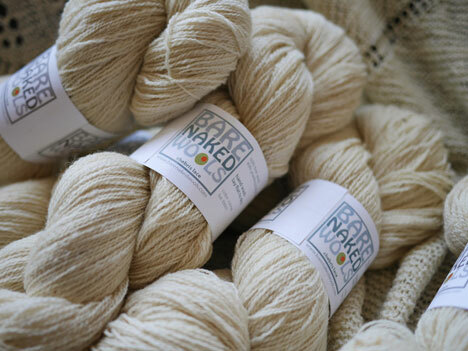 jeanne teaches classes in natural dyeing and uses her soft hues in colorwork projects such as mittens and hats. jeanne does natural dyeing, handspring, and knitting; john is a weaver and has a big look on which he can produce blankets and other fabrics. we left that day with about 225 pounds of fiber ranging in grade from kid to young adult and in all shades—white, red, steel gray, and black. 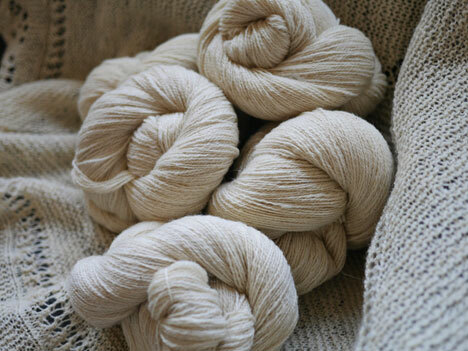 we drove it straight to sweitzer’s mill for drop off, planning that the largest portion—150 pounds of white and tan fiber—would go into our club yarn, a 60/40 merino/mohair blend in a heavy lace weight. 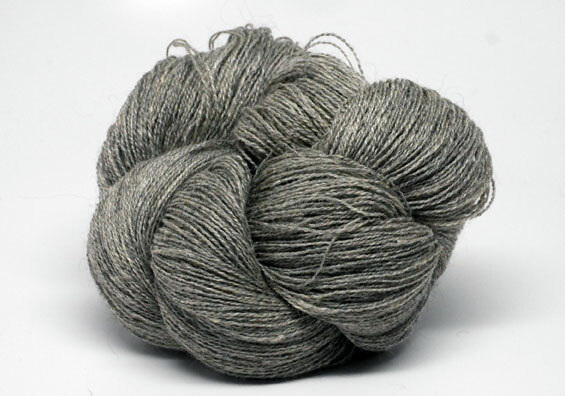 the darker fiber—including 25 pounds of kid mohair—would be spun afterward into the first generation of our cabécou brillant sport yarn—in poivre (more about this lustrous blend later). 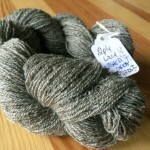 the club yarn—chebris lace—turned out lovely and as soon as i had sample skeins in the house i began work on the design we’d be shipping with it. 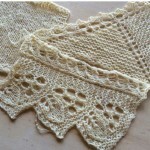 the 2-ply heavy lace yarn had a bouncy hand and while a bit bumpy in texture, offered great stitch definition. 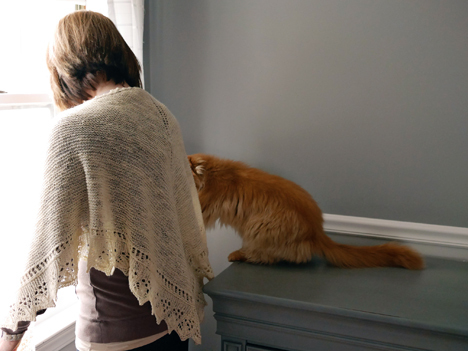 with such a generous yardage (750 yards per skein), i had plenty to knit a shawl project that could be a triangle or square, sturdy enough to be worn every day, but with a wonderful bold edging to show off some knitterly skills. 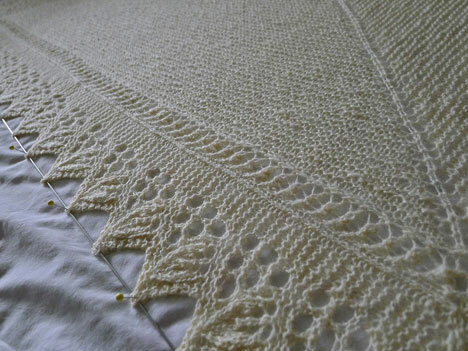 i kept the main portion of the project in simple garter stitch, which showcases so well the rustic qualities of the yarn but also lends balance and drape to the final fabric. the mohair content helped the yarn block out to a beautifully consistent surface, with crisp points accented by a soft sheen. 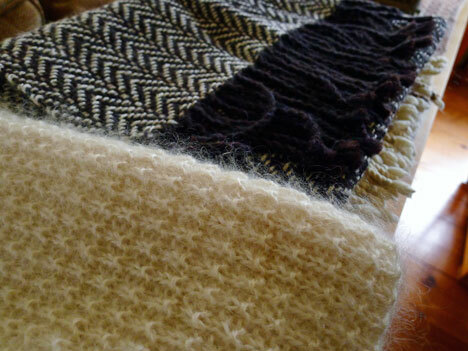 the result pieces were the deliciously soft and cuddly capricorn triangle and amalthea square. 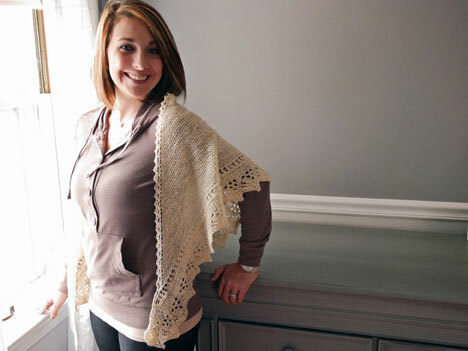 the triangle is simple, soft, and warm, but also dramatic when you want it to be. it makes a special gift for a new mom—something to toss for those walks between bed and nursery, or when sitting nighttime vigil with a fussy infant. and it works equally well for running errands out and about. 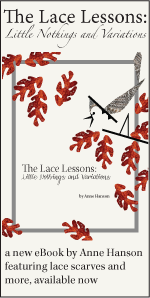 the pattern includes several sizes so it can be tailored to any function or frame you like. on the other hand, the square shape of amalthea is generous enough to perform all sorts of roles—baby square, sofa throw, nap blanket. the garter fabric is sturdy and highly functional for these tasks while the grand edging gives it some fancy flare. the patterns for capricorn and amalthea are now available for purchase in the knitspot pattern shop or in our ravelry pattern shop. 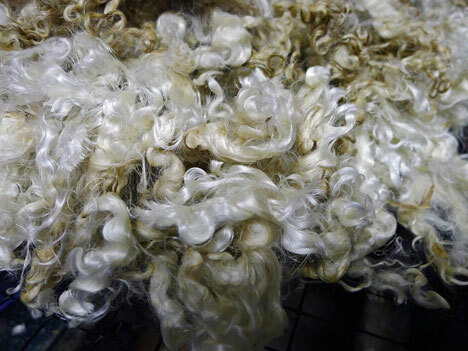 last summer we started working with a small mill in ohio and eventually they took over the production of our mohair yarns. with the new mill came the opportunity to spin a finer laceweight yarn, so we ran some tests with our luxurious cabécou blend. 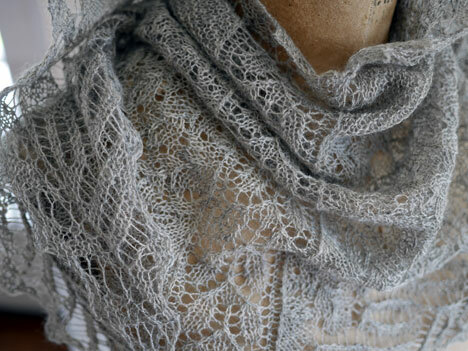 this yarn turned out SO beautifully—i just love the fabric it makes. 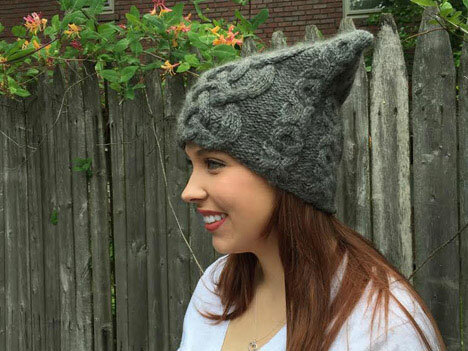 hattie knit this stunning pine and ivy sample from just half a skein—isn’t it incredible? the way it catches the light; it takes my breath away. 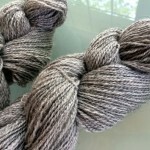 the yarn is fine, but has plenty of grip so it’s a pleasure to knit. 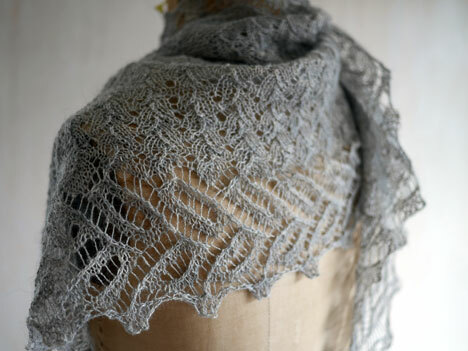 it will work with such favorite designs as the alhambra scarf, campanula, and nightingale wing stole. 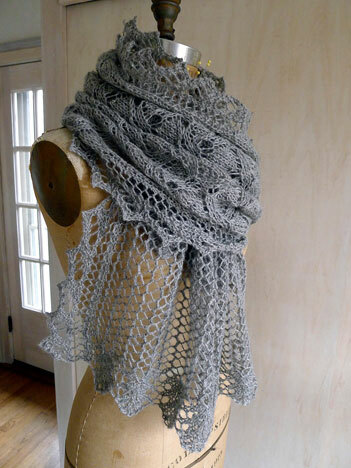 like this morning glory wrap, the gnarled oakwood wrap, obstacles, or stonewall. 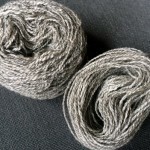 more experimentation resulted in the expansion of our chebris line as well, with variations in sport and worsted weight. 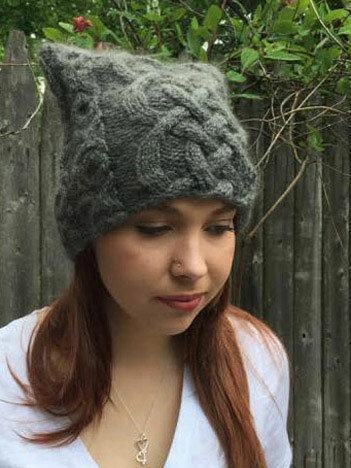 the worsted weight is so light and poofy; perfect for featherweight blankets, oversized jackets, and soft, delicious caps. it’s a knockout in cables—wow. the sport weight makes excellent blankets, too. 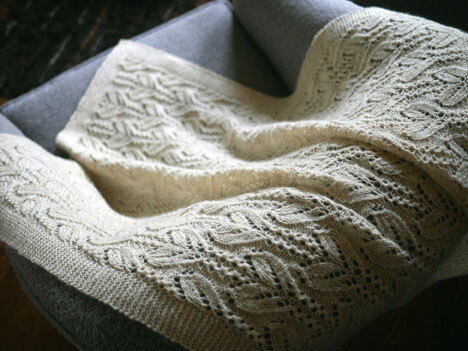 its lofty, bouncy hand—a direct result of using high quality fiber and handling it carefully—allows all of these yarns to be knit on larger needles than you’d expect. 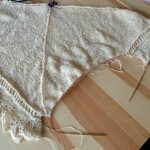 it almost seems as if the more room you give to each stitch, the more the yarn will bloom to fill that space. i love that! well, i could run on and on, but i’m sure you’re tired of hearing me talk, haha. how about a few more photos to dream on over the weekend? 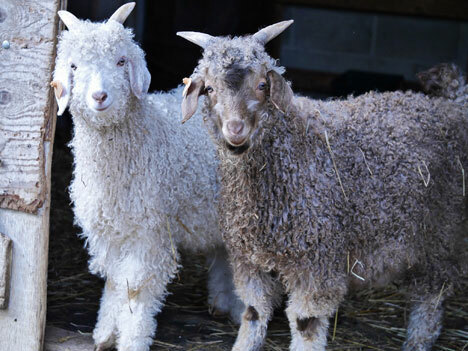 Those angora goats are just too cute! 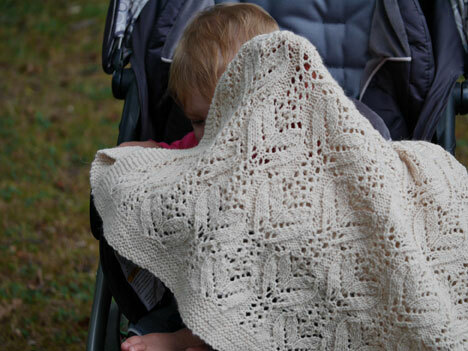 I see the crocus blanket I knit too, I wanted to keep that one, baby sized or no! Love it! 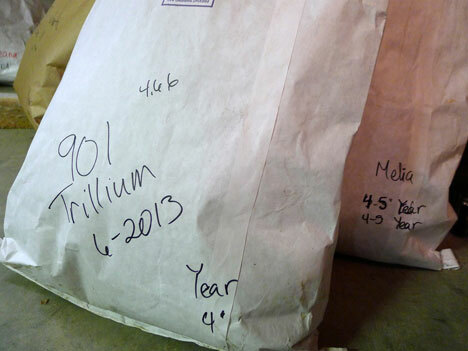 What a gorgeous crop…of goats, of fiber, of samples and photos…. absolutely lovely . Wonderful end products make me feel like an amateur ! So beautiful. Love the whole story ,and the goats! Thank you for this ! 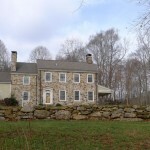 What fun – reliving that wonderful day with John and Jeanne sharing their hospitality and all their fiber treasures. Thanks for another great memory Anne. So much fibery beauty–but I lostmconcentration after the beautiful baby photos! Wow. Loved the story and the photography! 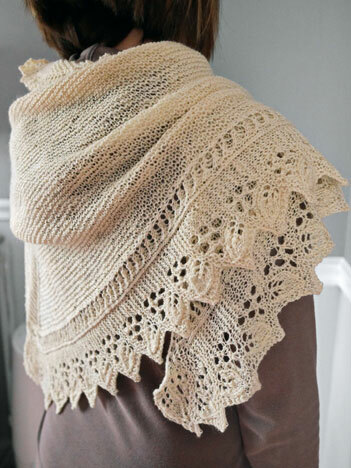 All creations are stunning, especially Hattie’s Pine and Ivy shawl! Very interesting post, providing lots to think about. 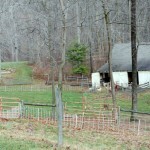 Gardens and goats. Gosh! John and Jeanne sound like such an interesting couple. 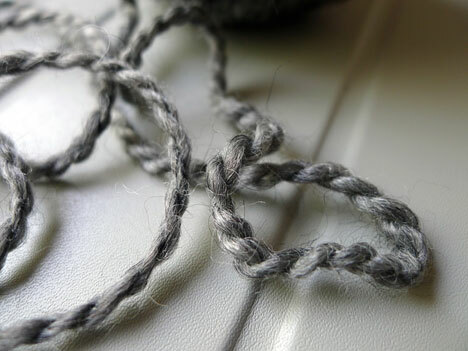 It’s fascinating to read about how the yarns have come about. Nice knitting skills! And those cute little goats they are so adorable. I just love your posts. By the way what is your email? Wow. 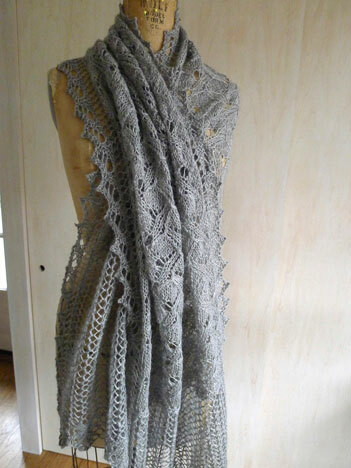 Stunning shawls, simply beautiful knit up in this.